We are still getting a handle on working things at the new farm. Last time we loaded up a steer, it was easy. He was very tame. Gary could get him to stand on a ball and juggle plates if he wanted to.We did not have to plan much for that one at all. 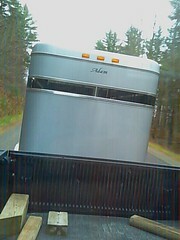 But the two steers (Angus-Hereford cross and a Hereford-Simmental cross) we loaded this past week were something else. Fence-jumping, charging, crazy and unsure of what we were trying to get them to do. 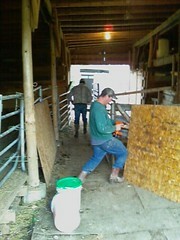 Enlisting the help of our brothers-in-law, we built a chute in the barn that led to the trailer. We had a moment where one of the steers burst through that piece of plywood you see like he just had a makeover on a daytime talk show, but with take 2, both steers ran down the chute and were safely ensconced in the trailer. I think we all sighed with relief when that door slammed. And down the road we went. 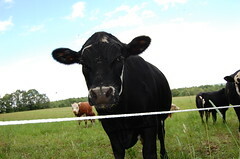 Posted in Cattle. 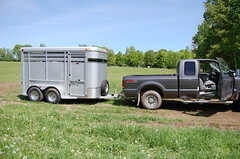 Tagged with cattle, chute, steers, trailer.